The validity of the theory of McCumber [Phys. Rev. 136, A954–A957 (1964) ] has been tested by applying it to a number of ground-state transition in various rare-earth-doped glasses. 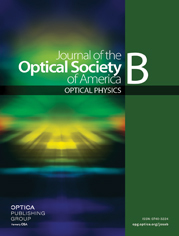 Special attention was given to those aspects of the experimental procedure that can lead to systematic errors, such as reabsorption of fluorescence and baseline subtraction uncertainties in the absorption measurements. To ensure consistency between absorption and fluorescence measurements, we used the same geometry for light collection and measurement. With these experimental procedures properly implemented, we find that in all cases there is excellent agreement between the spectral shape of calculated and measured cross-section spectra at room temperature. This is true even for the thermally coupled (H9∕22,F5∕24) and F3∕24 levels of Nd, which span an energy range of ∼2000 cm−1, much larger than the typical width of a single Stark level manifold. The results suggest that, at room temperature, the McCumber theory is not restricted to crystalline hosts but remains valid for the broader transitions characteristic of rare-earth-doped glass.